Home Why are my windows misted? Gary Warby, Owner of Premier Windows explains why misted windows can mean three very different things. Windows can mist for a variety of reasons. Some of these are attributable to the way in which we live our lives, some are down to climatic conditions, while others could mean that it’s time to change your windows. So what’s normal, and when do you need to consider changing things? Misting and condensation on single glazed windows The cause of internal and external condensation is moisture in the air and dew point. This is the point at which moisture and water vapour in the air forms into droplets or ‘dew’ when in contact with colder surfaces. If you still have single-glazed windows, this is why you get condensation on colder days. Your home is full of moisture from things like cooking and showering. If it’s cold outside, single-glazed windows will be cold on the inside. The water vapour in warm air is attracted to the colder glass, forming internal condensation. If you still have them and you can i.e. you don’t live in a listed building, going into the autumn will be a great time to replace them with new energy efficient double glazing. If your property isn’t suitable for double or triple-glazing you might want to consider secondary glazing as an alternative. It works on the same principles as energy efficient double-glazing adding a second slim-line window to the inside of your existing window. Misting on double glazed and triple glazed windows Internal misting on double-glazed windows Internal misting is less of an issue in double glazed and triple glazed windows because the temperature of the inside pane is warmer in comparison to a single glazed window. The cold air outside is blocked by the cavity and the external pane. Double glazed windows will however still mist or form condensation on the inside pane if moisture build up inside your home is excessive or not properly ventilated. The whole point of double and triple glazed windows is to keep warmth inside your home, cutting the cost of heating. They do this through energy efficient glazing units and by provide a far more effective seal than old windows, stopping warm air from leaking out or cold air leaking in. This means that if you’re creating moisture in your home (which you are) you need to make sure that you ventilate it effectively. Cooking, washing – it all contributes to the moisture content of the air inside your home and you need to let it out. The importance of ventilation Energy efficient windows and doors seal your property, so you need to make sure that it’s adequately ventilated. At its most basic, simply opening a window in a bathroom after showering, can make a huge difference to the build-up of moisture within your home. If it’s doesn’t do the trick you might want to consider installing extractor fans in high moisture areas, for example bathrooms, showers and kitchens. Window trickle vents provide another solution, these allow a controlled, consistent and low level air-flow within your home, bringing in fresh air and removing stale moisture filled air. Good window installation businesses will raise this with you as part of the window design process. External misting on energy efficient double-glazed and triple glazed windows in autumn While properly ventilated energy efficient windows can contribute to a reduction in internal condensation in reducing the amount of heat escaping from your home, means that in certain conditions, they can make it more likely that mist will form on the outside. During cooler late summer and autumn evenings, the energy efficiency of thermally efficient double glazed units over single glazed windows, means that there is so little energy and warmth escaping your home, that the temperature of the external pane, falls to a level below that of the air temperature or the dew point. This means that the vapour that occurs naturally in the air condenses on external glass, which can leave windows misted on the outside in the mornings. The rule is that the warmer the air the more vapour it can ‘hold’ so as the air temperature warms up with the morning sun, this external condensation or dew, evaporates back into vapour. It’s reason why in late August and September, you’ll start to notice the heavy dew on grass. Although on a handful of mornings when specific climatic circumstances are right, it means that you can wake up to external condensation. Does it mean my windows are faulty if mist is forming on the outside? Mist on the outside of energy efficient windows means that far from being faulty, they’re actually doing exactly what they’re meant to do by stopping heat loss from your home to the world outside. That’s why external misting is more acute on triple-glazed and the most energy efficient windows and doors. It’s also nothing to worry about and relatively short-lived. The dew point is variable and as the air temperature cools outside as we head into winter, the small amount of heat that will continue to escape from your windows, compared to the far colder air temperature in winter, means that they’ll remain clear of condensation. So if you are looking out through externally misted windows while reading this article, you can feel smug that your windows are performing and by the time you’ve reached the end and had another cup of tea, they will most likely have cleared. What does mist between glass panes in a double-glazed unit mean? At face value a double glazed or triple glazed may simply look like two or three panes of glass ‘sandwiched’ together, but new energy efficient IGU’s in common with energy efficient windows as a whole, are packed full of cutting edge technology. As well as low-e coatings on the glass which create a thermal barrier, preventing heat transfer, they also use warm-edge spacers used to make up glazing units create space between warm air inside and cold air outside, which is then filled with inert high density gas, normally argon or krypton. Denser than air, it provides an additional barrier to heat transfer If you have mist between the panes of glass in your double or triple-glazed window, it means that the insulated glazed unit has failed – but also that the high density gas which is absolutely critical in helping your windows do their job has escaped. There’s no need to panic – argon and krypton are naturally occurring gases, inert and are so diluted by the time they escape into the environment, that won’t do you or anyone any harm. But they are a sign that your windows aren’t working properly, may be older or were poorly made and offer a far lower rate of thermal efficiency than new energy efficient windows and doors. 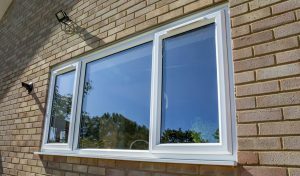 This means that at the very least, you will need to replace the double-glazed unit but it may also be worth considering wider replacement because if your windows are old, frames won’t be as energy efficient and hardware won’t be as secure as those used in today’s high security and high performance windows. For more information email gary@premwindowsanddoors.co.uk or call a member of our team on 01296 422842. .